The Sizzix is a cutting and embossing machine described as “The Ultimate Crafters tool!” It cuts paper and fabrics into predefined shapes and also creates embossing effects. It can be used for home decor, scrap-booking, quilting and card making but my main interest is in the fabric cutting capabilities. various sources and of various types; like curtains, ties, jumpers, dresses etc. I already have good dressmaking scissors and a rotary cutter but the accuracy I was looking for just wasn’t there when I made this quilt. 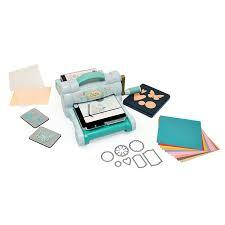 With a Sizzix Big Shot Starter KitI would have had perfectly sized squares and in a fraction of the time. 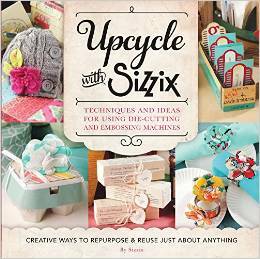 Sizzix have just announced the debut of an a book specifically for upcycling, great news, more ideas for projects! As always, before making a purchase, I like to do my research and this is what I found out about the Sizzix and where to buy for the best price. Cut fabric shapes accurately – my main reason for wanting one. Depending on the thickness, shape and fabric type you can cut several layers at once, this will save lots of time! Steel precision dies for years of use and no sharpening needed. Maximise fabric by aligning to the blades edge. Wide range of different shaped dies available. It’s portable so you can take it along to friends or groups. Cuts designs up to 15.2cm wide and 33cm long. The Sizzixis a hand operated roller machine which takes your fabric/paper/card through the machine cutting whatever shape you’ve chosen. This is an excellent video from Amanda Evans, from opening the box to cutting shapes with paper and felt she takes you through all the steps. The second video is taken from the Sizzix official website and shows what the Sizzix can do. The only negative comment I found was this one and I had to really search hard to find it! In a word, yes! With the solid construction and the versatility, this machine will be perfect for getting accurately cut fabric pieces. I can see all kinds of ways I can use it from a small piece of applique on a bib to a complex quilt block. Share your Sizzix stories with me in the comment box below, I’d love to hear them! For someone who has stated that she doesn’t like ironing you might wonder why I’m writing this guide to my top 10 steam irons under £50! 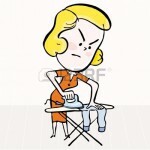 It’s simple, if you’re a dressmaker you need a decent iron. An iron that you can’t clean or that spits brown water over your your hard work just won’t do. I needed a new iron and always do extensive research before making a purchase. I researched 10 steam irons under £50 and chose to review the 5 I considered to be the best buys. 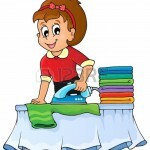 I’ve already done the hard work and found you what I think are the best value steam irons available. Read my reviews and make sure you’re like the 1st character and not the 2nd! These are my top 5 based on features and price. Continuous steam output up to 40 g/min with 130 g steam boost- Steam output is measured in grams of weight as it leaves the soleplate. The heavier the output the deeper the steam can reach into the fabric layers. This way you need fewer ironing strokes to evenly moisten the garment and therefore less time to complete the ironing. It’s also great for those stubborn creases and getting a sharp crease on your garments. 2400 Watt enables constant high steam output – 2400 means energy efficiency.The cord has a 360 degree swivel for making it easier to iron. No more tangles and twists means you get yoru ironing done faster. SteamGlide soleplate is Philips premium soleplate – SteamGlide soleplate Philips innovation soleplate. It is scratch resistance, glides perfectly and is easy to clean. Steam is distributed evenly across the soleplate..
Vertical steam for crease removal in hanging fabrics – The iron can be used vertically and the steam is powerful enough to be used to iron out creases from curtains or hanging clothes. You can use this function for freshening up clothes. Safety Auto Off – 3 state automatic cut out feature. Drip stop system – Lets you iron delicate fabrics at low temperatures without getting stains from water droplets. Especially good for silk fabrics. still for 30 seconds on sole plate. 30 seconds lying on side. standing on heel rest for 30mns. No more worrying if you’ve switched the iron off when you go out! This is a great iron towards the top end of my £50 budget. It is worth every penny just for the extra features you won’t get on a lower priced product and my first choice out of the top 10 steam irons I reviewed. Click here to buy from Amazon with free delivery! Ceramic soleplate – ceramic soleplate will glide effortlessly glide over fabrics cutting down on ironing time and ensuring a crisp sharp finish. Anti-drip and anti-scale – This feature stops water dripping at lower temperatures and staining your garments. Variable steam – steam settings to suit various fabrics plus a powerful 35 g/min steam output and 95 g shot of steam, great for those stubborn creases. Also useful for getting that extra sharp creae on your trousers. 2 year warranty – Russell Hobbs products are guaranteed for 2 years, you usually have to pay extra for this lengtrh of warranty. Safety light – this indicates when the iron is at it’s optimum temperature, and ready for use. Vertical steaming – useful for removing wrinkles from furnishing fabrics, curtains and from hanging clothes. It can also be used to freshen up garments. Self-clean function – comes with an anti-scale agent to prevent the build up of scale. Fine mist water spray – perfect for dampening dry areas. This is a good buy if you’re on a tight budget and with a 2 year warranty included what’s not to like. Autoclean soleplate – Smooth ironing thanks to the Palladium Autoclean system. The system uses catalytic oxidation as the iron heats up to transform the fibres stuck on your iron into gas and steam. This soleplate has also has been specially made with a built-in anti-drip system and has extremely scratch resistant and hard wearing properties. Steam Power Zone – 170g/minute shot of steam thanks to the steam Power Zone. Helps to make light work of difficult and stubborn creases thanks to the Aquaspeed’s two times faster shot of steam via a trigger control. Refilling in only 4 seconds – You can fill this iron quickly thanks to an extra large water tank opening with no splash or spills. Large water tank – A 300ml water tank saves you from having to keep refilling, great for getting through the ironing quickly. Front fill – This gives you for extra safety when filling the iron. Easycord system – Keeps the cord away from the clothes you are ironing and comes with a long 3m cord. Double anti-scale – Anti-scale and anti-drip functions for easy maintenance, no more drip stains on your clothes with this anti-drip function. Extra large open heel – This provides extra stability when standing upright and means it is for safer storing away. Enhanced glideability – raised lines running across the soleplate ensure excellent heat distribution and reduce surface area resistance making for a crisp finish on your clothes. Vertical steam function – This is ideal for getting creases out of suits or other hanging garments It can also be used to de-crease curtains and freshen up clothes. I liked the extra large open heel for stability of the Tefal FV5370G1 Aquaspeed Ultracord Premium Steam Iron, the raised lines for glideabiity and the large water tank. A feature packed steam iron for a good price. Vertical Steam – The iron can be used to steam vertically with enough power to remove creases and refresh curtains or hanging clothes such as suit jackets or dresses. T-IonicGlide soleplate – This is the Philips patented coating which glides easily and makes it very scratch reistant. 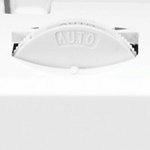 The carefully designed shape and vents provide an even steam distribution for faster crease removal. Easy de-scale & reminder – In addition to the Quick Calc Release a more thorough clean of your soleplate will remove the most stubborn calc. A clean soleplate will improve your steam performance and ironing results. Fast heat up time – It only takes 2 minutes to heat up. Triple precision tip – The tip of this Philips iron is precise in 3 ways: it has a pointed tip, button groove and a sleek design of the nose. 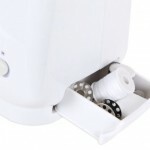 This enables you to reach into tricky areas of your clothes such as around shirt buttons or between dress pleats. CordGuide – The innovative CordGuide clicks to your ironing board and keeps the cord out of your way when ironing. 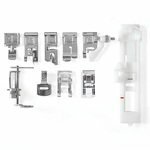 Drip stop system – Drip Stop system lets you iron delicate fabrics at low temperatures without having to worry about any water droplet stains. Quick Scale Release – This is a detachable scale outlet located at the back of the iron. When your iron is left on the heel rest, scale particles are collected at the base, which can be emptied quickly for fast and easy cleaning. No more white marks or having to rewash clothing! Safety auto off – To save energy, the appliance switches off automatically when it has not been moved for 8 minutes when left standing on its heel. and after 30 seconds when left resting on its soleplate or sides. There are a lot of good features with this iron. I like the triple precision tip on this one and the quick scale release. I didn’t like the short cord length, at the top of the budget a decent length cord should be standard. Dry/Steam/Spray and burst- a powerful 35 g/min continuous steam output and 110 g shot of steam for easier ironing plus, variable steam settings and temperature. Stainless steel soleplate – For gliding smoothly over your fabric. Powerful vertical steam – The iron can be used vertically and the steam is powerful enough to be used to iron out creases from curtains or hanging clothes. You can use this function for freshening up clothes. Large water tank – Generous 300ml water tank, lets you iron for a long time before you need to refill. Mist spray – Fine mist water spray for dampening your clothes prior to ironing. Anti-drip – Iron at low temperatures without getting stains from water droplets. 3 year guarantee – for peace of mind. 2m power cord – this extra long cord also has 360 degree swivel. Self-clean function – helps to keep your iron in tip top condition. Soft touch handle – for comfort grip. The Russell Hobbs 21570 Steamglide Iron is a good budget priced iron. While it might not have as many features as the more expensive models I thought it was worth a mention for the 3 year guarantee and the 2m cord. Speed Control with Start / Stop Button. LED Display Screen with Automatic Stitch Length and Width. Easy-to-Load Top Drop-In Bobbin System. Easy Threading System with Automatic Needle Threader. Electronic Auto Pilot (allows you to sew without the foot pedal). Ready, Set, Sew! DVD Included. LOTS OF STITCHES TO CHOOSE FROM! 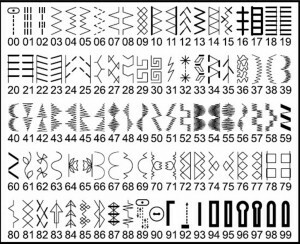 With such a large selection of stitches you know you’re going to have great fun designing and making your project. This Singer 7258 sewing machine has a good selection of feet gives it the versatility to suit all your sewing needs.There are ten Singer presser feet included in the price, something I rarely see, they are usually “optional extras”. Darning / Freehand Embroidery Foot. One feature I love is the automatic tension. How many times have you spent precious time fiddling with the tension to get the perfect stitch? It is designed to give the perfect stitch over all fabric types. The LED display is another useful feature. It displays selected stitch and stitch length & width settings. 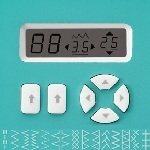 The stitches are automatically set but you can be creative and override these easily with the control buttons. We all want our sewing machines to do 1 step buttonholes so how about 6 different styles to choose from! 5-Minute Start –TheQuick Start Guide takes you through the basics and will have you ready to sew in 5 minutes. Auto Tie-Off Function for Straight Stitch – Tie-off straight stitches with the push of a button. Reinforcing the seam and prevents unraveling. On-Board Storage – The storage is in the Free Arm Storage Area keeping accessories handy. Sewing Speed – A maximum sewing speed of 750 stitches-per-minute means projects can be sewn quickly. Automatic Presser Foot Pressure – You don’t need to make making presser foot adjustments, it’s all done for you. Extra-High Presser Foot Lifter – There are two heights to the presser foot lifter great for quilting or bulky fabric. Six-Segment Feeding System – A specially designed feed dog that makes sure the fabric is picked up and supported from the front of the presser foot to the rear. Twin Needle Capability – Twin needle stitching creates two parallel rows, adding a decorative touch. 13 Needle Positions – Needle position can be changed for individual projects, such as inserting zippers or cording and topstitching. Snap-On Presser Feet- No need for fiddling with a screwdriver to change feet! The Singer 7258 sewing machine isn’t a huge machine so easily portable for taking to sewing classes. The dimensions are 14.5” length x 7.5” width x 12” height. The machine weighs 14.6 pounds. The official You Tube video gives you a feel for the true size, always good when choosing what to buy. The Singer 7258 sewing machine is packed full of features and built to last. I particularly like the extra high-pressure foot lift, the automatic tension and the snap on presser feet. The older Singer machines didn’t have this feature! It gets excellent reviews, from beginners right through to experienced sewers which you can check out at Amazon. A great machine for a great price! 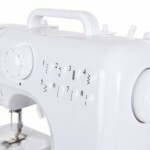 My friend is a complete sewing novice and wanted a basic compact sewing machine on a very low budget so bought this one. It is what it says on the box, a basic machine suitable for beginners or, if you want a portable sewing machine to take to classes, a sewing group or friends house. Can be used with batteries (very nifty!). Hand switch or foot pedal. My friend brought the machine to me for some tuition. The last time she used a machine was at school (many moons ago). I gave her the minimum guidance, the best way to find out if a sewing machine is suitable for beginners! It is very light and easily portable. We ran it from the mains but tried the battery function and it worked just as well on this setting. She managed to thread it without any help just by following the instructions. Tensioning can be tricky on some budget sewing machines (Low / High) 8 built-in stitch pattern that don’t have automatic tensioning, my friend had no problems. Her first task was turning up a hem which it did very well. The stitches are neat on the slow speed. At this point, my friend became more confident and tried the faster speed with the other stitches. She found this easy with the turn of a dial. She was delighted with the results and impressed with the results for such a low priced and compact sewing machine. Not suitable for thicker fabrics. This compact sewing machine is ideal for someone just starting out and on a tight budget. I liked it and would be happy to buy it as a present for someone.